The earliest known pudding recipe is thought to be from circa 1420. The ingredients list includes blood, oatmeal and the gut of a porpoise. While I'll happily admit to being able to recite Delia's Puddings book backwards, I'm almost certain I've not seen any mention of porpoise guts in her sensational steamed syrup creations. Infact, the first known puddings were pretty much sausages. Thank goodness for human advancement you may well argue. Forget the development of the wheel, sliced bread, twitter or electric hand held mixers, development of bread and butter/summer/treacle pudding from a sausage recipe is what I call progress. Both sweet and savoury puddings are most welcome to grace the Tea Time Treats table. Perhaps you've a family favourite Yorkshire Pudding recipe. Or a sensational Sticky Toffee Pudding recipe. Maybe you've always wanted to share your Souffle? The full details on the challenge can be found right here. Please email me: teatimetreatschallenge@yahoo.co.uk by 27th the the month with your entry! If you mention your post on twitter let us known (#teatimetreats @KarenBurnsBooth @whatkatebaked) and we will retweet all those we see. Meanwhile, Karen's glorious masssssssive round-up for all the crackin' citrus entries for January's Tea Time Treats is posted here on Lavender and Lovage. And to kick start this month's proceedings, here's my entry. While perhaps not the most sophisticated or glamorous of puddings, it certainly is a comforting pud of the highest order. 1. Preheat the oven to 200C/Gas Mark 6. Lightly grease the pudding dishes. 5. Serve with a very generous dollop of thick custard when still warm. You may notice it is the middle of winter (there's snow to prove it). Apricots are no way in season. Hence the tinned version. The almonds, inspired by Jane Grigson's Apricot Crumble recipe in her 'Fruit Book', add an extra elegant sweetness to the buttery crumble. And if you would like a pudding-sausage recipe, look no further than right here. I'll be sticking to the sweet, 21st century versions myself. brilliant theme... not great for the waistline but hey, who cares! I love sausages, but not in pudding! (although I did once have a pigs blood chocolate pot at Bocca di Lupo which was surprisingly tasty, if a little metallic...). These look lovely - one of these days I must take part in one of your wonderful challenges! I am in the thinking box on the topic of pudding, as I find it a bit challenging. I can do puddings! Yours look delightful. 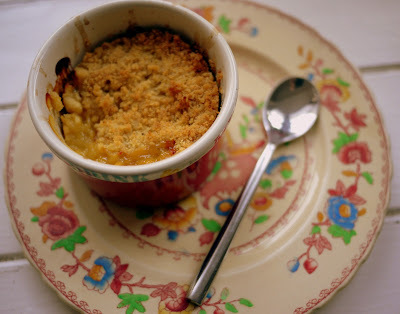 Apple crumble has been creeping in to my mind a lot lately....yours looks yum! Now here's an idea - blood sausage for starters and your delicious crumble to finish. 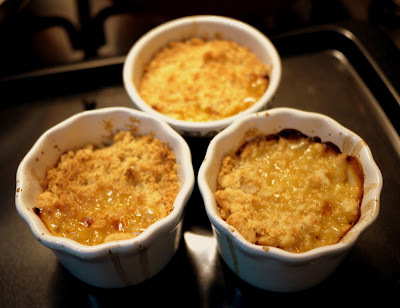 I don't think anything quite beats a crumble Kate and these sound superb. I've a pudding in mind I've been meaning to make for at least three years now, so maybe this is the excuse I've been needing.